When you are grateful, fear disappears and abundance appears. Live every day with an attitude of gratitude. There is power, real power, in gratitude. Embracing gratitude, recognizing all that is good, is the gateway to real fundraising. Solid fundraising. The kind of fundraising that takes your donor on a journey from first-time donor to loyal donor to monthly donor to legacy donor. It is the superpower that moves your organization into a place of abundance. Here are a few examples. Your third grant declination comes in the mail. Rather than tossing it in the trash, you spend five minutes writing a short letter thanking the foundation for their thoughtful review process. You’ve set up your CRM to trigger your executive director the instant an online donation comes in from a new donor, so she can make a welcoming thank you call. There’s a reason why we’ve been recommending that our clients, students and subscribers implement a daily practice of donor thank you calls. This very simple daily practice goes a long way towards instilling an organizational attitude of gratitude that’s downright contagious. 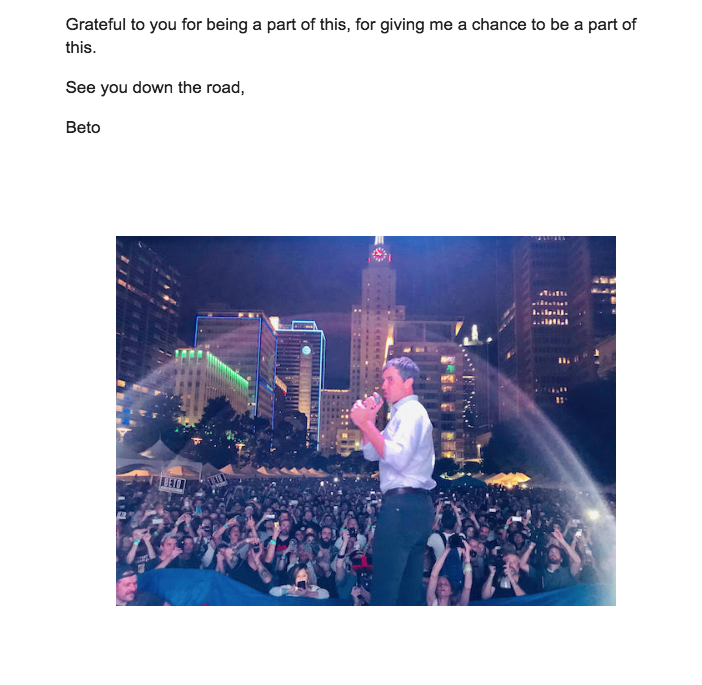 Case in point: this marvelous thank you email from Texas Senate candidate Beto O’Rourke. Simply titled “Grateful,” there are lessons to be found. O’Rourke raised over $61 million for his campaign. He is not personally wealthy with millions of dollars of his own cash to spend in the race. More importantly, he accepts no donations from political action committees.